Today, approximately forty-five percent of the population worldwide have access to the Internet, according to a report published by Internet Live Stats. Technology is making a positive impact on the way people learn. Learners can access training anytime and anywhere. Educational institutions and corporations are opting for online learning instead of physical classroom training. The bottom line is that technology can help you design learning that is more engaging and cost effective. Picture this. You want to buy a home theater system. You order a state-of-the-art system online and wait with bated breath for it to arrive. Once it arrives you are super excited and you invite all your friends to show them your new toy. But alas, you realize that you are unable to figure out the settings and navigate yourself through the numerous options available! Your party is ruined and you have spent a good amount on something you can’t seem to figure out. But you can save the day. You call the company and ask them to send someone over to demo the system. Once the expert takes your through the nuances of the system, you are able to handle it yourself. The situation with e-learning and technology is similar. Technology is at your disposal. You can work wonders with it, But, you need to be aware of how to use it to get the best results out of it. There are quite a few learning tech trends that can help you design effective and engaging e-learning courses, but we will talk about the most popular ones. Here are six prevalent trends. When creating learning strategies for your organization, you need to consider the tech elements and societal influences these trends have on the learning. With the rise in mobile and internet usage, people shop, browse, learn, and do a variety of activities on mobile devices. They are not just tied to the desktops. The overall look and feel of the page you are viewing depend on the browser resolution and your device specification. Responsive design platforms are popular because they adjust the layout of the content based on the device you are using. The end goal of responsive design is to provide every learner with the same experience, no matter what device they use to access learning. The content is organized in a fluid manner so that it adjusts to the dimensions of the device used. It is crucial to use a responsive e-learning tool. Such tools make your life easy. Buttons, images, menus, fonts, and most elements adjust automatically without you having to bang your head on the wall every time you create a new module. Responsive courses are a must-have feature if you want your learning to be accessible to a larger audience. While designing e-learning, we tend to optimize the size of videos, images, and other multimedia. No matter how much you simplify and optimize, these elements require huge storage space. It is not recommended to store them on the local server due to issues in speed and security. The best way to store them is on the cloud, possibly using a cloud-based learning management system. Cloud storage services allow data to be managed and maintained remotely. Users from any location can access these files anytime they wish to as long as they have an Internet connection. You need not worry about speed and learner experience, either. Most service providers provide backup and troubleshooting facilities, too. Learning on the cloud facilitates location agnostic learning. You can access learning from a Beach in Bali, while another classmate can access it from the comforts of his/her home. Neither of them needs to be in the classroom to learn. Yet, they both will have a seamless experience. Virtual reality refers to the three-dimensional environment generated by computers. VR can enhance the e-learning experience by making it interactive. VR has been around for a long time, but it has entered the learning arena, only recently. You can create a much more realistic learning experiences with VR. This technology is, usually, leveraged for risky tasks but you can create simulations in a real-life environment for the learners. The real-life feel provides a more engaging learner experience, without the risks involved. For example, during a safety training, you spill some hazardous chemicals or blow up a building while rescuing inmates, there is no real-world consequence attached. The damage occurs in the virtual world and is risk-free. You can practice as many times you want without causing any harm to yourself or others. The more you practice, the better you learn from your mistakes. No matter how good the theory books are, the best way to learn is by doing. VR allows you to bring that experience to the learners. Using VR in e-learning can be expensive. But with high-resolution smartphone screens and motion sensors the cost has come down to some extent. You also need to consider the return-on-investment in terms of learner engagement and retention. Microlearning refers to delivering content to the learners in bite-sized chunks. Short how-to-videos, focused lessons, one-page job aids, and so on, are a few examples of microlearning. This is an upcoming trend and is here to stay. Microlearning modules can be developed quite fast. You can even update them without much hassle. Organizations are aware of the limited attention spans of their employees. Providing learning in small chunks can combat this challenge. The popularity of microlearning is in part based on the easy availability of and access to mobile devices and the Internet. Without this tech boom, microlearning would not have existed. Download the presentation, “Practical Microlearning – Let’s make a long story short“. Gamification refers to the application of gaming techniques to a non-game environment. In gamified learning, the user is made to explore and learn in a way that it does not feel like formal learning. However, games and gamification are not the same. Games are fun and help you relax. 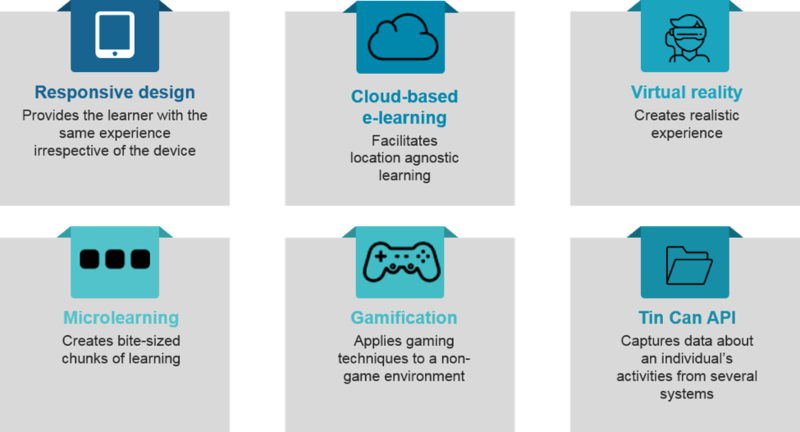 Gamified learning or gamification takes the fun elements from a game and utilizes it to improve the engagement and knowledge retention of learners. At the end of the learning experience, the learner will have to learn a concept or a skill. The learning aspect is compulsory. It just adds the fun part to learning. Download the free whitepaper on, “12 Tips to help you evaluate and implement Gamification“. Gamification is not a new concept. But it keeps on evolving depending on the technology. It is an extremely powerful tool and improves employee performance. The possibilities of using it in the learning sector are endless. More organizations are embracing it to make a difference in learning. The initial cost of gamifying may be a bit on the higher side, but the benefits it provides in the long-term justifies the investment. Tin Can API is a learning technology specification that helps in capturing data about an individual’s activities from several systems. Any device that can run Tin Can API is able to provide data about the individual’s activities in the required format. In simple terms, Tin Can allows you to track and record information about the learning behavior of any individual learner. The data captured is far more detailed and can be analyzed to plan future courses by mapping what the learner already knows and what he needs to know. Now, you have a fair idea about the latest e-learning technological trend. But do you think your business has a Learning Management System (LMS) that can facilitate the current trends in e-learning? Does your LMS allow you to offer the latest mobile learning options or include gamification for online training? Does it support micro-learning modules? If your answer is ‘No’, then you may want to consider switching to eLeaP. eLeaP simplifies e-learning with the help of tools and resources that lead you to success. It is a configurable, cloud-based LMS that can help your organization to enhance team performance. You can create new, customized courses from existing files. You do not need to be technically sound to work on the LMS. A non-technical learning designer, too, can work on it with ease. 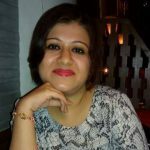 Sayantani Banerjee is a professional with 13+ years of experience in the field of content writing, eLearning, and instructional design. She is passionate about anything related to eLearning.